In this and the ten listed Articles linked below MALCONLAW summarises the main construction insurances that are available and their function. 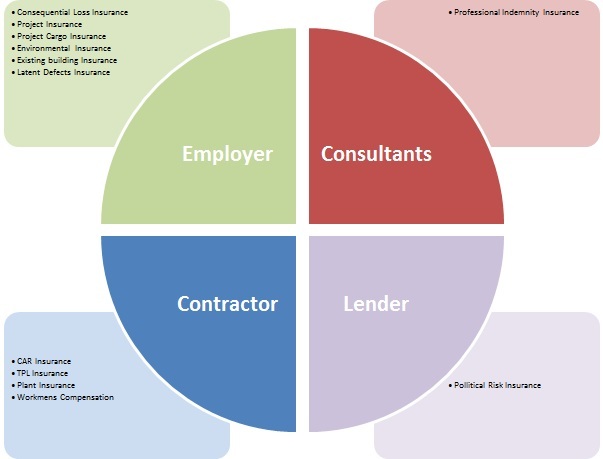 You will appreciate that the insurance market is always changing and as such all parties involved in the risk management of projects and the insurance of such need to take account of the way in which the market changes in respect of the insurance industry both internationally and also domestically in respect of construction risks. Managing of a construction projects insurance precise requirements needs careful and detailed analysis of the risks associated with the project and an understanding of the various insurance protections commercially available to mitigate these risks. Large construction projects which involve civil, electrical and mechanical works and will always require the special handling by an expert with experience in the procurement of the required insurances. Professional Indemnity Insurance, Contractors All Risk’s Insurance, Contractors Plant Insurance, Project Cargo Insurance, Consequential Loss Insurance, Environmental Insurance, Existing Building Insurance, Latent Defects Insurance, Public Liability and Unexpected Archaeological Discovery Insurance are the main insurances which we consider in this article. The lead consultant or Employer Representative if charged with the overall management of the insurances is always faced with many difficult choices such as which insurance policies, what coverage, what limits, what deductibles and similar issues. Construction projects like any other risks require a balance of risk control and risk financing as part of on-going the risk management exercise. Feasible options under risk control techniques are loss prevention, loss reduction and risk transfer. Loss prevention requires adequate safety measures to be kept in place so that losses can be prevented from happening in the first place. Losses however do occur despite best efforts and therefore loss reduction techniques should be applied in order to mitigate the losses after it happens. Alternatively there remains an option to control risk by contractually transferring the risk to a third-party to the Contractor, Subcontractor or other party to the contract. As a result of the cost of insurances the Employer or Principal of a project may decide to retain the risk and finance the losses through either on-balance sheet or off-balance sheet provisions. Alternatively where they consider insurance available at commercially viable rates and transfer the risk to an insurance company. Normally, a prudent risk management exercise will facilitate the Employer or Principal to achieve a balanced mix of risk transfer to an insurer coupled with certain amount of risk retention. (4) The Bank or Lenders responsible for funding the project. All these stakeholders have different interests in the project and accordingly the risk profile of each is different. The Employer or Project Owner runs the potential risk of losing his investment if a major peril strikes. They are also faced with the risks of consequential losses due to the delays and inherent defects in the structure which may cause losses. They may however attempt transfer these risks either in part or in full to the Contractor. The Contractor and his Subcontractors are then not only susceptible to the losses arising out of risk transfer from the Employer through the contract but also have to live with the risks of material damage to works together with any existing property damage and surrounding third party property damage. They are further exposed to the potential losses in respect of their own personnel due to death or bodily injury to workmen and liability exposures from the third parties. The Design Team made up of Architects, Engineers, Surveyors and other design disciplines form the third block in the risk distribution matrix for a construction project. They may be held liable for defective design, professional negligence and errors and omissions in the conduct of their duties in the execution of their services. Many of these risks arising out of professional negligence for which the Contractors’ all risks insurance do not cover but can be covered under a separate professional indemnity insurance. The Banks as Lenders are faced with the asset risks and with the current magnitude of some construction projects these pose serious problems in the event of a misjudgment in their lending or financing agreements for such projects. They must therefore take into account, the expertise of the Design Team, the Contractor, their financial standing and track record are before financing a major construction project and this will be reflected in the conditions they impose to finance the project. Saying all that there can still be exposures such as market risks, political risk and as experienced recently financial crisis which can all occur but generally need to be allowed for in their financing proposals for the project. As a result of these considerations insurances for large and complex construction projects require risk management and treatment on an end-to-end basis. This starts with identification of risks followed by evaluation of various insurance alternatives available and culminates in taking out the suitable insurance covers with relevant and appropriate conditions and extensions by all the parties involved with the project.